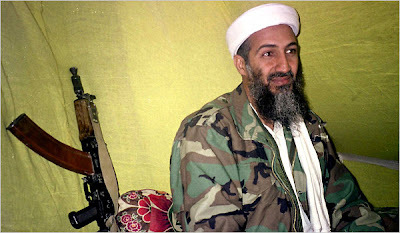 The Screaming Pope: "Bin Laden Killed"
The dramatic Times headline on the morning following Osama bin Laden’s “termination with extreme prejudice,” to use CIA terminology, reads, “Bin Laden Killed by U.S. Forces in Pakistan, Obama Says, Declaring Justice Has Been Done” (NYT, 5/2/11). It’s an interesting choice of words, since the headline might have emphasized the internecine implications of where Bin Laden was found, who exactly performed the attacks, and in what company the now-deceased terrorist leader found himself in his last moments on earth. For instance, Hiroshima conjures the now iconic image of the Enola Gay and its pilot, Colonel Paul Tibbets. Historic actions beg the question of how they were performed and who performed them. Surely the Bin Laden operation, which if nothing else will ensure Obama’s reelection, has implications beyond the fact that “justice has been done,” which is the broadest stroke with which this complicated, world-historical action can be painted. One wonders what would have happened if the generals' plot against Hitler had succeeded—would the tides of war have changed? It was widely thought that the toppling of Saddam Hussein would free Iraq, but the outcome of that maneuver has been far more complex, and tragic. If Qaddafi had been killed in the attack that killed his youngest son, Saif al-Arab, would Libya’s divisive opposition have suddenly become united, mobilized and energized in the common purpose of creating a democratic society? That question may soon be answered, as will the net effects of the destruction of Bin Laden on the terror network he controlled. In the meantime, mercantilism is always a good barometer. Will Toyota now open a dealership in Wajiristan? I have generally favored the historical approach which regards historical figures as the product of social and economic forces, but I think Zakaria makes a very good point in his post; in certain instances a charismatic leader becomes so powerful that he is not merely a vehicle for something greater than himself. It all reminds me of the Wicked Witch who has enormous power to perpetrate evil, her one Achilles heel being water.